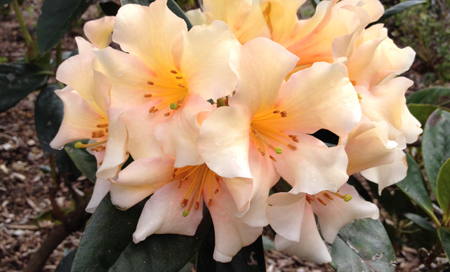 In the Nilgiris hills of southern India grows a member of Subsection Arborea called Rhododendron nilagiricum, named after the hills from which it was first collected and described by the Rev. Schmidt near Madras in 1836. The first recorded introduction to western gardens was in 1840 where it flowered eight years later. R. nilagiricum differs from R. zeylanicum (its close relative from Sri Lanka) in the narrower more pointed leaves with the margins slightly rolled under, and the upper surface dull green but still bullate, the lower surface has a spongy yellowish-brown indumentum. The flowers are in beautifully shaped trusses of deep crimson here at Emu Valley but can be crimson-rose or pink in its native home. R.nilagiricum have grown into sturdy single trunked bushes over 4 metres high standing proud with an air of grandeur about them, as most arboreums do, and when in flower at the end of September is a sight to behold. If you would like to meet these rare aristocrats at EVRG they live on the bank above the junction of the main gazebo road and the Bob Malone drive.